As anyone who’s spent 5 minutes looking into the topic of DIY websites can tell you, there aren’t a lot of options for those who aren’t full-on web developer gurus but are looking for more than a generic blog. And so I found myself slouching back to WordPress after kicking it to the curb half a dozen years ago. What’s my beef with WordPress? The short version of this rant could be, “Don’t make me think, WordPress.” The longer version? Well, I despise arcane menus, hierarchies and navigation. I mean, really–a reasonably tech-savvy yet casual user shouldn’t have to decode your labels, translate your menu and submenu structure and memorize where different tools are placed. But that is exactly what I conceded to doing after tearing my proverbial hair out. I just got sick of having to randomly click around to find what I was looking for. 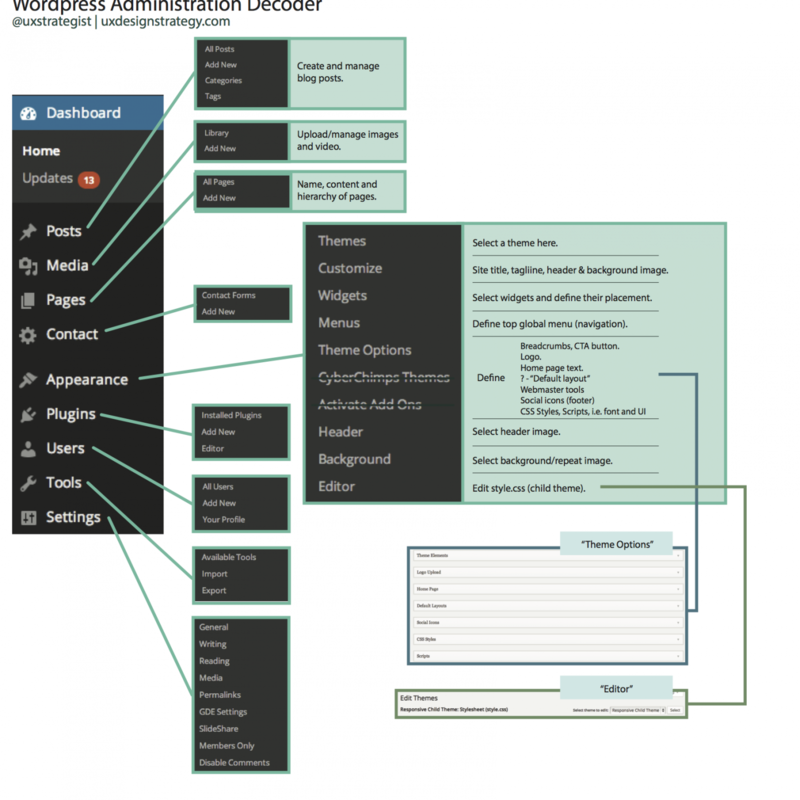 So I created this wordpress-decoder. 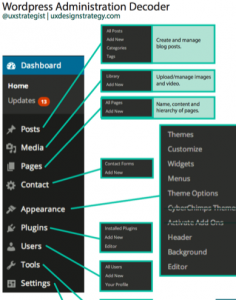 One could argue that WordPress passes the buck to the theme developer, and it’s the theme developer’s responsibility to create meaningful navigation, menus and information hierarchy for site administrators. And to provide user assistance/help for their respective themes. A user is a user is a user. If this is the case, then WordPress’ user would be theme developers. So make it easy for them to in turn make it easy for their users. And for goodness sake, the solution here is not a circa-1999 #$#@! forum with no search bar! As an aside, this isn’t an issue with just WordPress, I take issue with just about any software application that is clearly geared toward “expert use” (read: an excuse for a company not to make things easy on their users). Now that I’ve gotten that off my chest, I’m off to use my secret decoder ring.